I've been a successful freelancer for a long time, but I like to keep an eye on job postings and one of my pet peeves is the disconnect between job descriptions and the actual work required. I don't know if it's an HR problem, or if it's job posters trying to sound particularly sophisticated, but most of the time I have NO idea what they are even talking about. It makes me wonder if they do. Really, the level of blather involved is mind-boggling. The other thing that always gets me is when the job poster specifies that you must know particular software and then lists old versions of the programs. Are they trying to warn you that the employer doesn't keep current on software packages, or don't they know what the current version is? Really, if you can't take care of the job posting, how can I expect you to take care with the clients and projects? OK, getting down off my soap box now. Thanks for listening. A friend with an iPod Touch complained that her battery was always low, even when she barely used it. While she used the iPod primarily for photos, she didn't realize her Wi-Fi model was constantly trying to find a web connection. I advised her to turn on "Airplane Mode" (Top of the Settings screen)- the quickest and easiest was to turn off the WiFi, and that did the trick for her. If you have battery problems on your iPod Touch/iPhone, read this article, Four Ways to Make Your Battery Last Longer, by David Pogue- he lists 4 other quick and easy fixes. Designers hate boring. We just do. Utilitarian has its place, but just because something works doesn’t mean it can’t look good doing it. Designers spend their time and attention on package designs only to have mandated additions like codes and labels intrude on the space. It was just a matter of time before they turned their attention to that most utilitarian item, bar code, and decided to have a little fun with them. Originally envisioned in 1948, Universal Product Codes, or UPCs, weren't actually used until June 1974, but have since revolutionized the processes of inventory and sales checkout. But as long as we have to use them, why can't they be fun? Designers in Japan have been redesigning bar codes longer than we have, and they have come up with some really clever ones. But not every decorated code will work with every scanner - it is a science and an art to get code decoration done right for success with most scanners. Codes have error correction so the info can be redundant so they will still work if some part is covered. Many generators are out there and some allow branding like this one." 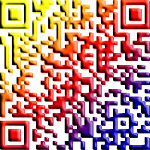 This flickr group has some very interesting QR code art. And one of the most inventive artists in this is Scott Blake. Have fun exploring and put your mind in creative mode- I bet you can come up with some clever ideas yourself! Should logo design pricing take usage into account? I was once asked by another agency to design a logo for a large pharmaceutical client’s new heart drug. They needed it in a couple of hours and the pay was paltry. I responded that the only way I would do it was if the client accepted one of my designs, I would be contracted to complete the job and further compensated. They declined. Did they really expect me to drop what I was doing, dash off a couple of comps and then stand aside while they reaped the rewards of my work? Obviously they were desperate, but their tactics were despicable, imho. This story does brings up an interesting question, though: if the same amount of work is involved in designing a logo for a local sub shop as for global conglomerate, should the price differ with usage? I know this grossly oversimplifies the problem, but do you charge differently for work that will reach a wide audience vs. that which will only be used locally? Working with huge corporations requires more time than with a local owner, but the design process is largely the same. If I design a winning logo and your product goes global, do I get any more compensation than a great portfolio piece and a pat on the back? Does design differ from widgets? Join the conversation and post your thoughts! When need a new look for your business, what's the first step? For businesses who have never worked with a designer before, the process can be intimidating. With most purchases, you can see what you’re buying ahead of time, but this is not the case with anything custom made. Where is the mind meld when you need it most? At the first meeting with the designer, direction can be narrowed down, minimizing time spent and missteps, so it’s important to convey your likes AND dislikes to them. Often, you don’t know what you want, but you know what you don’t want, and this information can be just as valuable. I start with corporate ID- your logo or type treatment. Once this look is chosen, it will be applied to stationery, business cards and anything else your business needs. When designing corporate ID, I work with the client to develop a theme; it could be a color, a typeface, an icon— whatever brands your company and reflects your corporate mission. What style is best- abstract, representational, emotional, reserved, personal or corporate? Is this a retail or a service business? I interview clients to get an idea of what will work for them, because whether I agree or not, the client has to love the look because they will be living with it for a long time. I will always advise clients if I think they are going in the wrong direction, but the clients always have the final say. Design is an evolutionary process; the first step used to be sketches, but now it is computer comps. (The problem with computer comps is that they don’t leave much room for interpretation or imagination— it's hard to get an idea out of your head once it's in there!) I discuss ideas with the client and then present comps- from three to five- and say, “tell me what you like and what you don’t like.” From their feedback, I refine one or two again and the process goes from there until we hit upon a finished product. The same process takes place as we work together to decide the best way to incorporate this new logo into stationery and business cards. Most buyers prefer a project price to an hourly rate, so they know what they are spending upfront. But by asking for a project price, you lock yourself into the upper range of cost, because the designer needs to cover themselves for the worst case scenario. Coming up with a logo can take anywhere from a day to several weeks, depending on the client. I like to give a price range; it will be at least this but won’t go over this without prior approval. That way I can charge the client for actual time spent without making them feel as if they are being asked to sign a blank check. Then we start over and work until you do! This may seem picky, and but a font and a typeface are not the same thing. A typeface is a particular design of letters, numbers & symbols. Helvetica is a typeface designed by Max Miedinger in 1957 (also a film) now so widely adopted that it appears everywhere. Fonts allow us to print typefaces- they are the collections of a typeface computers use to display and print a typeface on a page. Google either term and you can spend the rest of the day reading about the particular differences and history behind their development. Just as we use our vocabulary to accurately convey our thoughts, our choice of typeface and the spacing we use convey a subtle meaning as well. To correctly display type, pay attention to the kerning - the spacing between individual letters. Properly kerned, type should have visually consistent, not equal spacing, between letters. Adobe® refers to this as optical kerning, where the overall appearance is consistent spacing, an effect that requires some letters actually be closer to one another that others. A capital T, for example, would be moved closer to the next letter because otherwise it would appear to allow too much white space between them. If you think of each letter as being a single block. as it was when type was physically set by hand, you can get the idea. An “O” takes up the entire width of its block, whereas an A takes up the width only at the bottom and leaves more white space at the top; we kern some letter pairs to make the spacing appear visually equal. An i and a j might almost overlap at the bottom to achieve this effect. Tracking, is the space between the letters of an entire word or block of text. Tracking is used to space out the overall length of a line for design and layout purposes. Justified type is tracked to force each line of type to align with its neighbors to form a rectangular block. How you use tracking affects the legibility and ease of reading for the viewer. Spacing in typography subtly affects your message as well. Not only the spacing between individual letters or words, but between paragraphs and other blocks of type. Spacing indicates the importance or hierarchy that a block of text holds. Your headline should convey the broad topic and tone that your subsequent text will support. Separate thoughts into their own spaces and think of your layout almost as an outline- the flow from headline to supporting copy to details. Run-on blocks of text are hard to read and harder to understand. Copy should flow like your address- the planet, the country, the area/state/province, the town, the street, the house. This gives the reader structure so they don’t have to guess the importance that a particular part of your layout is trying to convey. Using typography and space wisely gives your message more impact! This second point is quoted from Steve Gibson, a security expert and chief executive of the Gibson Research Corporation, who created the fascinating and informative page How Big Is Your Haystack? where you can learn and experiment with different passwords and character lengths. This is a must-read for anyone who uses passwords online, so I send a big “Thank You” out to both Mr. Stross and Mr. Gibson! Will you use cloud computing? I swear Steve Jobs would mind meld our brains to our devices if he could. I’ve read that he never wanted the button on the iPad- he wanted everything to work with tactile input, and now it looks like he may get his wish with the next rollout— rumor has it that Apple just added multi-touch gestures for the iPad and next iPhone. But I digress- today’s topic is about cloud computing. With Jobs’ keynote speech on Monday at the WWDC (WorldWide Developer’s Conference), Apple introduced their next computer operating system, Lion, which will make our computers more like iPads, and simplify syncing across devices. Documents you create with Pages, Apple’s text editing application, for example, will be automatically saved to “the cloud” so whatever device you next use Pages on, your document will be available to you. This will likely spur more people to use Apple software, esp. those who are casual users, but is unlikely to change the habits of heavy-duty word processing or layout program users such as myself. So, readers, how comfortable are you with the idea that all your information will be stored on Apple servers? How much privacy are we willing to forgo to take advantage of the convenience and downright cool features available to us? Take a moment to vote in the poll! I came across this article in Inc. magazine on using QR codes to promote your business and it was so informative I wanted to share it with you. QR (for Quick Response) codes are those odd square boxes that look like someone threw a handful of black dots that resulted in a random pattern. They are actually very cool interactive codes that, when scanned with a code reader app on a smart phone will connect the user with a URL, a coupon, more information, or basically whatever you choose. You can get really creative with them, and either change up the code with the content, or use the same code but change the content by directing them to a URL which you update frequently. 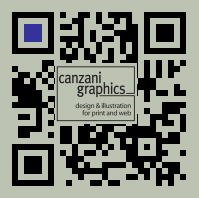 You can create your own QR code for free online; I used this site. What will you do with yours?